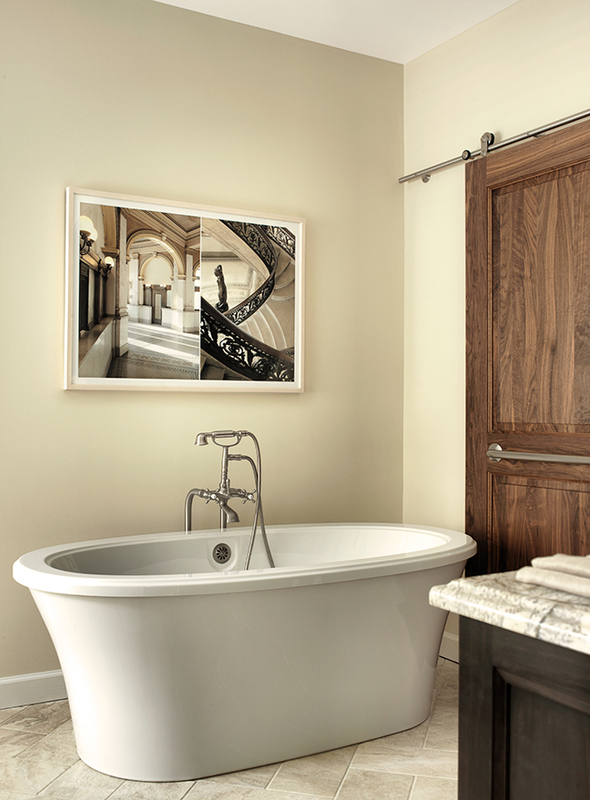 To bring the master bath up to the level of quality of the rest of the home, brooksBerry combined high-contrast materials with a modern curve, creating a masculine retreat. The homeowners’ requests: a large shower, a double vanity and a soaking tub. brooksBerry designed the shower with graphic color blocks of charcoal in the flooring and shower tile. At the end of the bathroom, a band of suede Brown Fossil stone was laid in a running-bond pattern, which sets the shower area apart from the rest of the bath. A matching custom-cut herringbone panel in the same stone was set on the back wall of the shower for a graphic punch. A large-scale antiqued marble was set in a herringbone pattern on the remaining floor and running bond in the shower. The alternating bond and herringbone patterns provide a textural experience. Blocked-out, open towel areas in the custom glossy-charcoal vanity provide storage, while the shape of the mirrors and oval tub bring a touch of feminine shapes to this otherwise masculine space. This masculine space is warm and welcoming. It is clever how the different floor materials define the shower, and we love how the size of the shower doesn’t overpower the room.